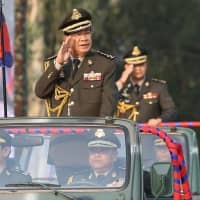 PHNOM PENH - Cambodia’s strongman leader Hun Sen on Thursday called on his country’s military to “destroy” opponents if the government comes under threat, in a tirade in which he described himself as the “the one who steers the wheel” of the army. The 66-year-old premier has in recent weeks turned up the rhetoric against the now-dissolved opposition party, the European Union and other critics of his government. Since his ruling party swept a July election widely considered a sham, the EU has warned it may withdraw its Everything But Arms scheme, which allows Cambodia’s lucrative garment sector duty-free access to its massive market. In the wake of the move, Hun Sen, a five-star general despite his position as the country’s civilian leader, has been even more outspoken than usual. 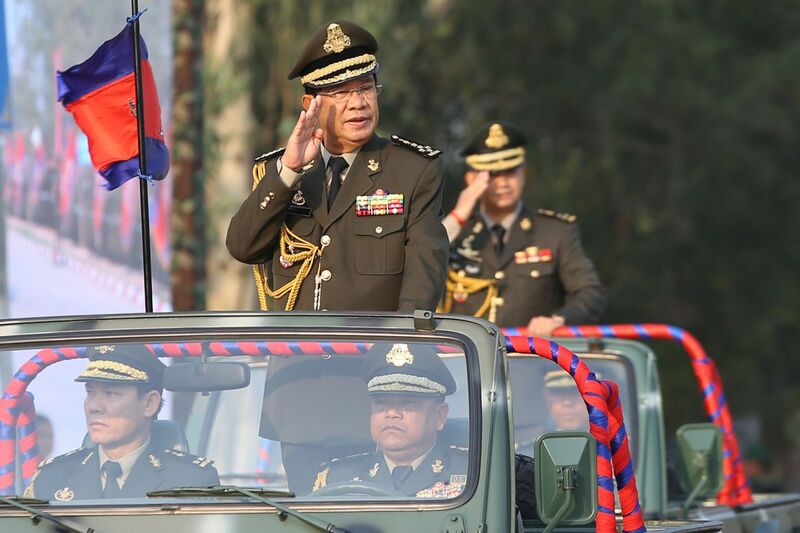 “Some people say Hun Sen is consolidating power … that is very correct,” he said in a speech to soldiers marking the 20th anniversary of the infantry — which is headed by his son, Hun Manet. Hun Sen urged the army to “destroy … revolutions that attempt to topple the legitimate government,” adding he is “not afraid to issue an order” if faced with threats. “Better to see the death of four or five people rather than the death of tens of thousands and millions,” he said, referring to the lives lost during the ultra-Maoist Khmer Rouge regime, which left a quarter of the population dead. “I am the one who steers the wheel,” he added. The wily former Khmer Rouge cadre has stayed in power for more than 30 years through a dense patronage network that analysts say largely benefits his family, the armed forces and the elite. The speech shows “exactly why under his rule political opponents and human rights defenders have been killed with total impunity,” said Andrea Giorgetta from the International Federation for Human Rights. While previously reliant on Western aid, Cambodia is now bankrolled by China. Hun Sen returned from a visit to Beijing this week with a near $600 million pledge in aid from Chinese President Xi Jinping.